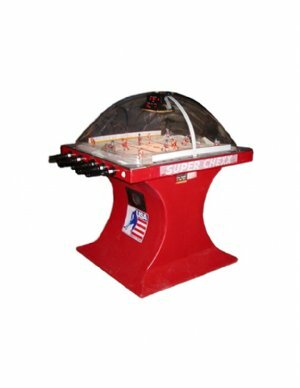 Dome Hockey Tables also known as Bubble Hockey was introduced in 1982 and is considered one of the classics of arcade games. WOW Entertainment's Dome Hockey Table is the authentic & commercial Super Chexx Dome Hockey. 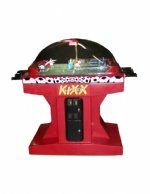 Our Super Chexx Dome Hockey Table has an indestructible dome, hockey figures that appear to skate on the surface of the play field and realistic crowd noises that accompany every shot pass, save or goal. If at the conclusion of regulation time, the score is tied, Super Chexx Dome Hockey will automatically go into an overtime period. Contact a WOW Entertainment event specialist at 800-WOW-1196 to discuss how this item will be suitable for your party or event.